There were 4151 total votes. More of you than I expected. Nothing I can do, as they're too powerful. Griffith and the God Hand are gods after all and have causality on his side. I wonder how Miura will have the drastically underpowered Guts face them. Guts may have killed off-brand Cthulhu but still. Off-brand cenobites are something else. Other: Fake my death and/or try to get the hell out of that world. ? Which is running away in a way, so picked that. Though honestly, I can't even decide what is my fave manga character right now, the world setting would affect the answer. It just might be "Nothing I can do, as they're too powerful." ? Well, I'd try to kill them to save myself, but in the end I'd probably just end up giving them a good fight and losing, not on purpose, but because they're too strong for me to handle. That being said, I have too many favourite characters to pick from, and some of them aren't physically strong at all, so who knows... ? Fun poll idea, btw ? Just try to keep running away. I've chosen this one, but I think that would make me go crazy because I would have to watch my back constantly. 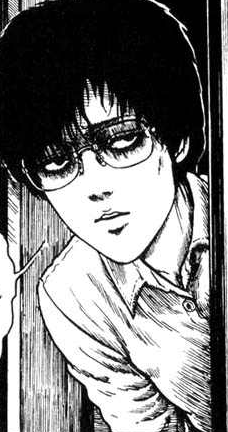 I would probably become as obsessed and paranoiac as Shuichi Saito in Uzumaki. Eh. I'll probably put up a fight, and then die. I mean I probs wont' survive in the manga world anyway, so might as well get some physical contact in with my favorite character before my death. Sorry I did not success in making available without clicking the link. Depends on which manga and at what point in the story. If it's a shounen manga, early on I might have a chance, but near the end I'm dead no matter what I do. Kill them instead. Your own survival is the most important! LOL. I was thinking the same thing. No romcom character ever going to kill me so I'm fine. Other: set up a meeting and negotiate your survival through intelligent and stunning persuasion.